Aries- You will feel inspired at the beginning of the week with the Moon and Neptune in Pisces providing a little Cosmic Bliss and Universal Love for Halloween. Burn some incense and remind yourself not to sweat the small stuff. The Sun, Jupiter, and Mercury in your House of Sharing and Pluto in your career area mid-week could have you working through the ups and downs of a Pro-mance with a collaborator or partner. Mr. Saturn balancing an opposition of Venus in your House of Relationships with Uranus in your sign will help you work this out, even if this other person does seems to be taking you for granted. The Full Moon over the weekend in Taurus should help your confidence rebound quite nicely due to an unexpected reward you receive that’s the result of an effort you made all by yourself. Gemini- With the Moon and Neptune in your Public Area to start the week you will be totally caught up in the mystery as well as in the pomp and circumstance of Halloween. Venus in your House of Fun and Uranus in your House of Groups with an Aries Moon will likely mean a crazy party, so you’ll no doubt also be concerned with putting together the perfect costume. It probably won’t be until later in the week with the Sun and Jupiter moving into opposition with a Full Moon in your House of Secrets, that you will probably want to change gears and spent some quality time with a special someone. Mr. Saturn always keeps a wine key in his go bag for exactly that kind of occasion. Cheers! Cancer- You’re a worrier by nature, which can thoroughly exhaust you much of the time, but this week your “Spidey-Sense” is being stimulated by the mystery of Halloween, so you’ll be right on the money regarding something you’ve been stressed about for a while. Mr. Saturn say’s, “trust your instincts and act on them.” Venus in your House of Home and Family opposing Uranus in the Public Sphere could suddenly bring on that challenge you’ve been anticipating, however, Mr. Saturn in the House of Maintenance will help you find the strength and resources to create an inventive solution. By the weekend when the Taurus Full Moon in your House of Dreams aspects Neptune in your House of Journeys and Jupiter in your Creative sphere, you’ll find you’re ready to face that new adventure, which only a little while ago seemed like it would be the end of the world. Leo- Some difficult news from home at the beginning of the week could have you waxing sentimental about the past and feeling guilty. Stop it! You’re a fixed sign so the challenge for you is flexibility- not with others, that’s easy, but with your own ideas when they have outlived their usefulness. Between Uranus in your House of Philosophy opposing Venus in your House of Thinking, Mr. Saturn is acting like a fulcrum in your House of Creativity and rocking your world back and forth like Atlas. This is to teach you about equilibrium or “going with the flow,” scary, huh? Over the weekend the Full Moon in Taurus aligning with Pluto will suggest you let go of the past and focus instead on who you will be next. This week’s haiku is for you. Virgo- Sometimes you feel cornered by the expectations of others, resulting in a need to withdraw or rebel. 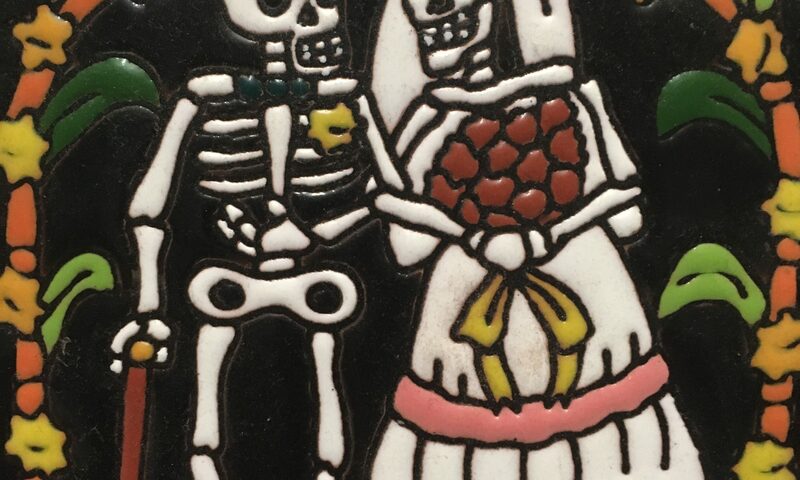 With the Day of the Dead coming up this week, now would be an ideal time for you to try to understand what drives these feelings and look to give them a symbolic death. The Moon and Neptune in your House of Relationships will have you doubting yourself at the beginning of the week, followed by a Venus-Uranus opposition that will make you want to resist the advice (or perhaps judgment?) of a family member or partner who think they know what’s best for you. The Full Moon in Taurus over the weekend in tandem with Pluto in your House of Creativity should help you in recognizing the pattern of how you first give your power away through lack of confidence and then take it back by rebelling, something Mr. Saturn would refer to as, biting off your nose to spite your face.” Nuff said! Scorpio- With all of the Major Planets currently traveling under the radar in your chart, you are totally in synch with the season in that you’re concerned with harvesting your real identity aside from what anyone else may think about you. The Sun in your sign is working with both Neptune and Pluto and requiring you to eliminate whatever isn’t working in your life, while at the same time motivating you to experiment with new approaches in regards to relating with others. When the Moon is Full in Taurus over the weekend it will be the first Major Planet to emerge into public view for you this week, meaning you are on the verge of discovering a sound foundation within yourself. Congrats! Now you’re ready to finally turn the tables on those people in your life who are always taking but never giving back. Sagittarius- Make sure you don’t drift off and get lost at the beginning of the week when the veil opens up between this world and the spirit world on Halloween. Although with the Moon and Neptune together on Monday, followed by Venus and Uranus having a tug of war afterwards, it will certainly be tough to maintain any gravitas in this world if you insist on letting others distract you from what you know you need to do for yourself. With the Sun and Jupiter behind the scenes in Scorpio this week, Pluto in your House of Self Worth, and Neptune rising like floodwater in the basement of your chart, make sure you throw a lasso over that Taurus Full Moon this weekend so you can pull yourself up out of the rising tide of selfishness that seems to describe too many of the people in your life. Aquarius- Your ambition is at its height, but don’t confuse that with insight into what’s really going on. Sort of like the difference between dressing up like a super hero for Halloween and actually being one. You want to lead and influence people but are you concerned about what they need or what you need? Neptune and the Moon at the beginning of the week will have you believing whatever you want, however, Mr. Saturn suggests that you may be blind to the forest for the trees. With Mercury unaspected in Scorpio and Uranus in your House of Communication, be careful when speaking to others. Don’t rip someone a new orifice with what you think is the truth without considering what it might be like to walk in his or her shoes. The Full Moon over the weekend may satisfy your ambition, but not without you giving up something. Let’s hope it’s not your humanity.